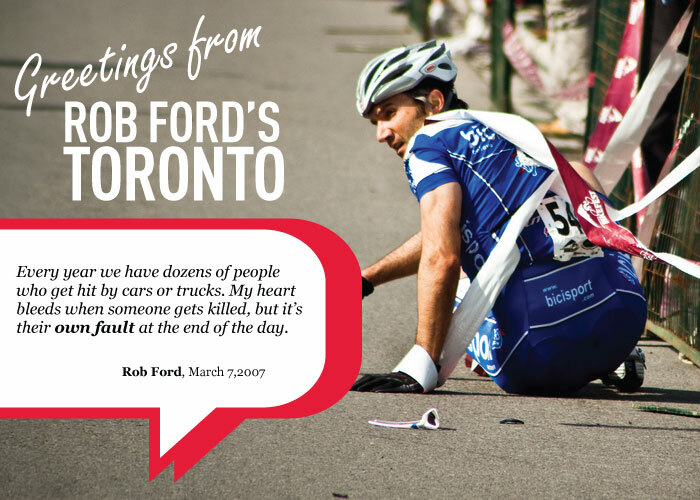 A ‘postcard’ from the Smitherman campaign painting Ford as anti-cyclist. This might not be the right solution for every street, but the idea of physically separating cyclists from motor traffic, where possible, is a good one. It encourages more people to try cycling. The concept is not new, nor radical. It’s just common sense, and that’s why separated lanes are being used in cities all across the world, from Berlin to Manhattan to Montreal. via Rob Ford: Cycling advocate? – thestar.com. I appreciate the call for a more nuanced perspective on these kinds of things, but my short response to this piece would be simple: just because you’re not advocating AGAINST something doesn’t mean you’re an advocate FOR something. Case in point: after Councillor Denzil Minnan-Wong, chair of the Public Works & Infrastructure Committee, revealed his plan for physically separated bike lanes in the downtown core in January, the response from the Mayor’s Office was swift. This kind of thing, they said, was simply not a priority. On a related note: There’s a bizarro world fight simmering over this issue, stemming from the Toronto Cyclists Union enthusiastic support of Minnan-Wong’s plan. They’ve even asked neighbourhood groups to write letters in support of the plan. This has put them at odds with Adam Vaughan, who has written a detailed letter explaing why he’s against Minnan-Wong’s proposals. Needless to say, if you had said last year that the Cyclists Union would be allied with Denzil Minnan-Wong, de facto leader of the “War on Cars” brigade during the Jarvis debates, against lefty man-of-the-people Adam Vaughan you’d probably have been called crazy. But here we are. I’d echo a call for a more nuanced approach to this issue. There are good reasons to be cautious when looking at Minnan-Wong’s plan, particularly as it may represent the sum total of all the on-street bike lanes this administration wishes to build. (In a 2009 interview with BlogTO, Minnan-Wong said “it’s not practical” for lots of bike lanes downtown: “Let’s determine where there might be one or two of them that they can use and let’s invest in those.”) But it would also be a shame to oppose it out-of-hand, as any new cycling infrastructure would be welcome at this point, particularly a new east-west route on Richmond Street. Minnan-Wong’s plan could be on the agenda when the Public Works committee meets next week. This entry was posted on Monday, March 14th, 2011 at 9:52 pm	and is filed under feature. You can follow any comments to this entry through the RSS 2.0 feed. Both comments and pings are currently closed.